Discussing economic related issues affecting the US and Canada. Back in 2005, as the US housing bubble started to pop, Paul Krugman wrote That Hissing Sound. This is the way the bubble ends: not with a pop, but with a hiss. Housing prices move much more slowly than stock prices. There are no Black Mondays, when prices fall 23 percent in a day. In fact, prices often keep rising for a while even after a housing boom goes bust. So the news that the U.S. housing bubble is over won’t come in the form of plunging prices; it will come in the form of falling sales and rising inventory, as sellers try to get prices that buyers are no longer willing to pay. And the process may already have started. Residential property sales were 2,853 in May – a 15.5% decline compared to May 2011. May sales were the lowest since 2001 and 21.1% below the 10-year May sales average. New listings totalled 6,927 in May 2012 – a 16.8% increase compared to May 2011. Last month’s new listing total was 15.3% above the 10-year average for listings in May. At 17,835, the total number of homes listed for sale increased 21% from this time last year. Sales have stalled and inventory is rising. To make things worse, yesterday the Canadian government made major changes to mortgage rules. Mortgage amortizations were reduced from 30 years to 25. Refinancing limit reduced from 85% of home’s value to 80%. Gross Debt Service ratio reduced from 44% to 39%. Government insured mortgages now limited to homes purchased for under $1,000,000. Minimum down payment of 20% for homes priced above $1,000,000. Cash-back and stated-income (liar) loans eliminated. HELOC maximum reduced from 80% to 65%. Any time the government tightens mortgage rules, it can have a negative effect on home prices. Coming at the same time as the market appears to be turning and with affordability at record lows, it will probably speed up the decline and could turn that hiss into a pop. 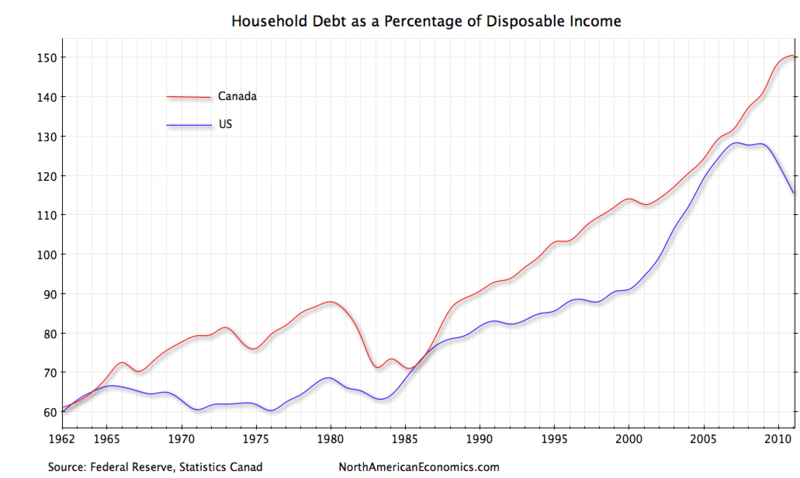 With all the information Canadians have heard about the US housing bubble and the incredible economic damage it’s bursting has caused, it’s hard to believe they would follow the same path – and yet they have. The average price of a Canadian home currently stands at $362,899 – about 70% more than in the US. 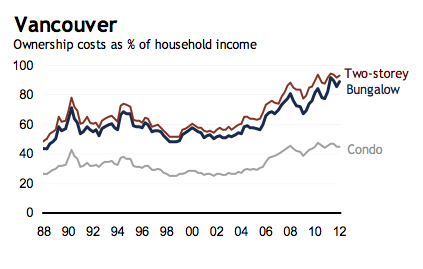 According to a recent article in The Economist, Canadian house prices are 29% overvalued relative to household incomes and a staggering 71% overvalued relative to rents. Things are even worse in Vancouver, where the latest Demographia Housing Affordability Survey ranks Vancouver the 2nd least affordable city in the English speaking world. According to the survey, the median price of a home in Seattle was $321,500 while in Vancouver it was $602,000. In the year since that survey was published, Vancouver prices have gone up another 7.8% while Seattle has gone down 7.1% – making a home in Vancouver more than twice as expensive as a comparable home in Seattle. This is in light of the fact the two cities are similar in almost every way – including incomes. How did things get so out of whack? Same way as they did in the US – with a debt fueled housing bubble. Lesson not learned. How will the situation resolve itself? In all likelihood the correction will also follow the path of the US – a multi-year housing crash which ruins the lives of countless Canadians and takes down much of the economy with it.